The College of Environmental Science and Forestry (ESF) will confer more than 450 degrees during Commencement exercises 3 p.m. Saturday, May 12, at the SRC Arena and Events Center, Syracuse. 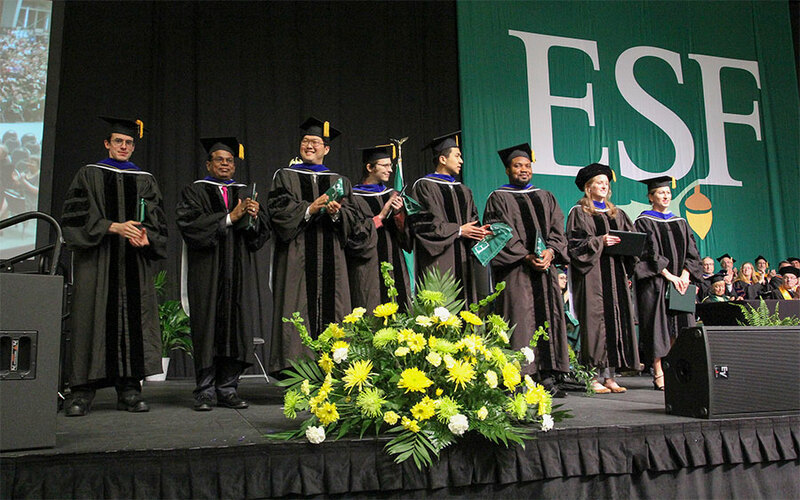 During the ceremony, ESF will confer approximately 392 bachelor's degrees, with about 95 students receiving master's and doctoral degrees. The college also awards associate in applied science degrees at the Ranger School in Wanakena. Those graduates will include 15 students in the forest technology program, 29 in the environmental and natural resources conservation program, and 10 in the land surveying technology program. They will receive degrees during a ceremony May 19. Commencement weekend festivities in Syracuse begin at 9:30 a.m. Saturday, May 12, with the Honors Students' Ceremony in Gateway Center Room A. The Honors Ceremony will be followed by the Environmental and Forest Biology Awards Ceremony at 11 a.m. in 5 Illick Hall. Curriculum-specific receptions for degree candidates, their guests and members of the ESF college community will be held at noon at various campus locations. The college's Commencement will be at 3 p.m. Saturday, May 12, at the SRC Arena and Events Center, Allyn Hall Gym, at Onondaga Community College. Bachelor's, master's and doctoral degree candidates will be honored. Dr. Eleanor J. Sterling will be presented with the Honorary Degree. Sterling is the chief conservation scientist at the American Museum of Natural History's (AMNH) Center for Biodiversity and Conservation, and an affiliated professor at the Museum's Richard Gilder Graduate School. During the ESF ceremony, departmental honors will be bestowed upon the top students in each of the college's discipline areas. Benjamin Taylor of Panama, New York (environmental resources engineering), will be the student speaker. Christine A. Gilbert of Bernhards Bay, New York (environmental health), will present the class gift. Joint Commencement exercises with Syracuse University will begin at 9:30 a.m. Sunday, May 13, in the Carrier Dome. Student Marshals leading the ESF degree candidates in the Commencement procession are Chloe Blaisdell of Lafayette, New York (conservation biology), and Taylor. ESF departmental scholars are Daniel Fougnier of Solvay, New York (chemistry); Kelsey McLaughlin of New Bethlehem, Pennsylvania (environmental and forest biology); Cole Jermyn of Salem, Massachusetts (environmental resources engineering); Michael Jorgensen of Skaneateles, New York (environmental science); Isabella Kaplan of Buffalo, New York (environmental studies); Mitchel Thomas of Conklin, New York (forest and natural resources management); Kaitlin Campbell of Latham, New York (landscape architecture); and Laura Wengert of Jamesville, New York (paper and bioprocess engineering). Student Chancellor's Award honorees are Jet'aime Lewis of Murrieta, California, (environmental biology) and Taylor.